The Milky Way is surrounded by elusive, invisible dark matter galaxies, and we finally have a way to find them. Astrophysicists have already discovered dozens of visible satellite galaxies orbiting the Milky Way by picking out clusters of stars from images like Fig. 1. Each of these galaxies has a halo of invisible dark matter that does not emit or reflect light, but they all also have stars at their centers that give away their location. However, we also expect there to be smaller dark matter halos around the Milky Way that aren’t quite big enough to gravitationally pull together clumps of gas at their centers to form stars. These are the invisible Milky Way dark galaxies. Why do we care about these tiny, invisible clumps of dark matter? Well, first of all, they are only tiny by galaxy standards. These dark galaxies can have masses equivalent to more than a million suns. More importantly, they can teach us about the mysterious nature of dark matter. Leading theories of dark matter predict many of these dark galaxies should be orbiting the Milky Way (Fig. 2). If we can’t find these galaxies, the theory of cold dark matter, on which our whole understanding of the evolution of the Universe is based, could be in trouble. In today’s paper, Denis Erkal and his coauthors use a creative method to search for evidence of these invisible galaxies. They look for the effect on external stars as these dark galaxies barrel along their orbits around the Milky Way. Dark matter does not emit light, but it does interact through gravity. 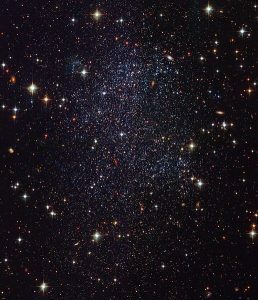 This means that as a million suns worth of dark matter travels through the galaxy, stars will feel a gravitational pull. In particular, if one of these invisible galaxies passes through a really dense region of stars, it will leave behind unusual patterns that give it away. Stellar streams are long, dense regions of stars and are therefore excellent places to look for evidence of dark galaxies. In particular, this paper examines the stellar stream named Palomar 5 (Pal 5 for short). Pal 5 is a globular cluster stretched out into a stream by the gravitational potential of the Milky Way. The short explanation of this process is that stars closer to the center of the Milky Way feel a stronger gravitational pull than the stars farthest from the center. This causes the inner stars to be pulled away from the outer stars, stretching the cluster into an elongated stream. (For the full explanation of how the gravitational potential of the Milky Way can produce stellar streams, check out this astrobite.) This stretching should turn globular clusters like Pal 5 into long, relatively smooth streams. However, Pal 5 has unexpected lumps and gaps that can’t be explained solely by the Milky Way’s gravitational potential. These features may be evidence of those invisible dark galaxies that are so hard to find. Erkal et al. discovered these unusual lumps and gaps by looking carefully at images taken by the Canada Hawaii France Telescope in Hawaii. Fig. 3 shows the image of Pal 5 and a model fit to the data that more clearly illustrates the unusual features. The original globular cluster is centered at Φ1 = 0 with the stellar stream extending in both directions. If you look closely, you can see a decrease in density around Φ1 = -3 and a much wider decrease with a minimum at Φ1 = 9. Fig. 4 shows how the density varies across the stream, including high density peaks and low density troughs corresponding to lumps and gaps. The variations near the central cluster around Φ1 = 0 can probably be explained by normal motions of the stars, but the two deeper dips are more unusual – possibly the result of the flybys of two different dark galaxies. Using simulations of the gravitational interactions between stars in Pal 5 and the dark galaxies, the authors demonstrate that dark galaxies could in fact leave behind these gaps after plowing their way through the stellar stream. However, it is also possible that a Giant Molecular Cloud produced the smaller gap and that the bar of the Milky Way produced the larger gap. Irrespective of the current uncertainty, we now have a way of checking that the Milky Way is in fact surrounded by invisible dark galaxies. This is an important step towards verifying the theory of cold dark matter. Superfluid dark matter fills ’empty’ space, strongly interacts with and is displaced by ordinary matter. What physicists mistake for the ‘clumpiness’ of dark matter is actually the state of displacement of the superfluid dark matter. The Milky Way’s halo is not a clump of dark matter traveling along with the Milky Way. The Milky Way’s halo is lopsided due to the ordinary matter in the Milky Way moving through and displacing the superfluid dark matter, analogous to a submarine moving through and displacing the water. What ripples when galaxy clusters collide is what waves in a double slit experiment, the superfluid dark matter which fills ’empty’ space. Superfluid dark matter displaced by ordinary matter relates general relativity and quantum mechanics. The superfluid dark matter is likely a sea of massive dark photons which ordinary matter moves through and displaces. The sea of massive dark photons displaced by ordinary matter is the quantization of gravity.